Journaling reads; Alaska sled dog puppies are so cuddly. It was wonderful to hold them close and keep them warm. 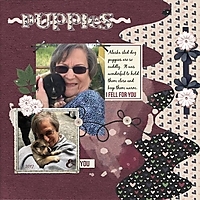 I Fell For You collab kit by GingerScraps designers. 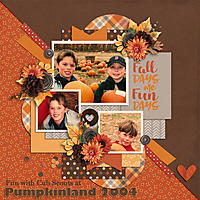 Curve shapes by Cathy K Designs also of GS. Fonts are BlackJack and CryKitty. All puppies are adorable. I like those eyecatching curves and interesting color pallette, too. I really like those abstract-looking wavy paper strips on the right side, they give the page a very interesting look. The grunge behind the pictures is great, and I love how you have the string tacked down. 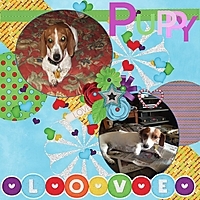 Adorable puppies and such cute journaling!